It's hard to believe that it's already been two whole weeks since our return from Paris. It took a bit of time to get back on schedule and catch up with the odds and ends of daily living, but catch up we have and we're movin' forward! We're seeing some beautiful fall colors and are currently enjoying sunny skies, balmy breezes and temps in the 70s. We'll take it, since we know what's coming just around the corner. It is Michigan after all. Now let's get back into the kitchen OK? 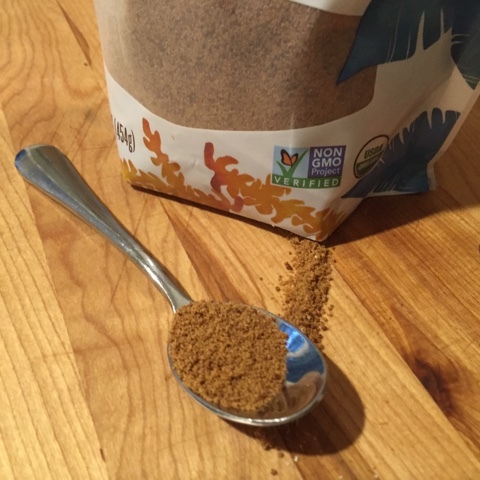 Before we left on our France adventure I had purchased some coconut sugar as a result of perusing the various sugar choices on the grocery store shelf. The package info tells me that the coconut blossom is the source for this unrefined, sustainably grown and harvested sugar which tastes nothing of coconuts but has its own subtle taste. It's touted as being great for baking as a 1:1 replacement for white sugar. In addition, my sister Mary had sent me a jar of Tonewood maple cream as a birthday gift, and it was just waiting to be used. This stuff is made in Vermont by cooking and whipping pure maple syrup to a state of creamy goodness. What's not to like. First the coconut sugar. I'm tweaking my shortbread flavor list for the upcoming holidays and decided to do a lime coconut version, so I substituted half of the sugar in the recipe with coconut sugar. It looks like brown sugar and actually tastes like it too - toasty, caramel-y and very pleasant. It did give the dough a slightly darker hue than usual . . .
and the cookies baked up more browned and toasty looking. There was really no difference in the flavor - still tasty - so for me it's simply a matter of using an unrefined sugar in place of a refined one. 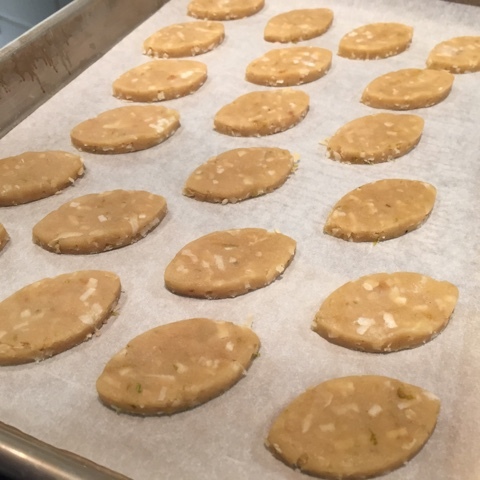 I've been doing this for some time with unrefined raw cane sugar which gives a pleasing crunch to shortbread cookies or as a topping for things like financiers. 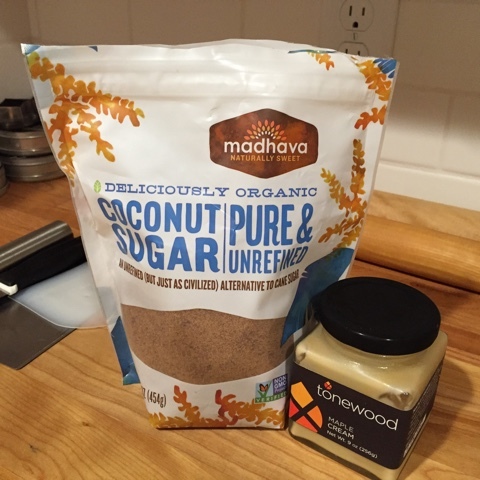 In a nutshell - coconut sugar seems well suited for general baking uses - you decide! Next up - maple cream. 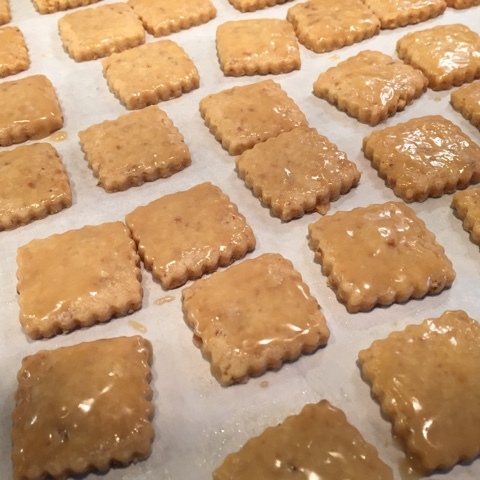 Maple walnut shortbread is one of my faves. 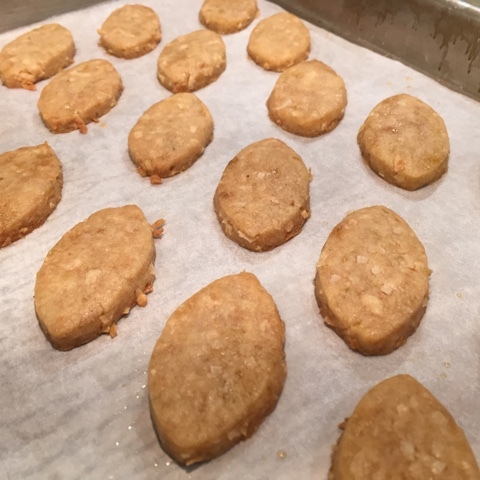 I typically reduce the amount of cane sugar in my recipe, add maple syrup and then brush the warm, just-out-of-the-oven cookies with more maple syrup. Hey! I'll use maple cream instead. This stuff is delicious - wonderful maple flavor and a texture that can't be beat. I used it in the shortbread dough just as I would maple syrup. Once the cookies were baked I brushed the tops with maple cream . . .
and popped them back in the oven for a couple of minutes. 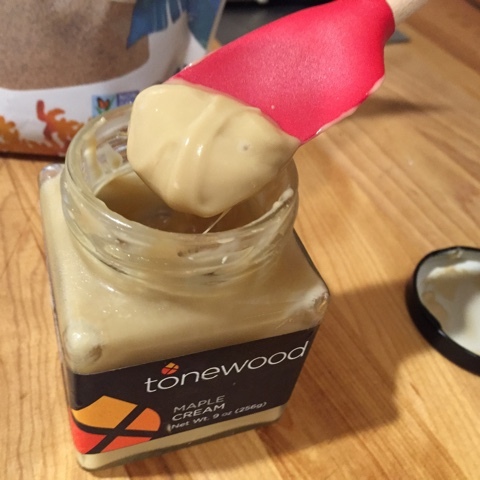 Tonewood's web site describes the maple cream as "the perfect spread over toast or pancakes or used as a dessert frosting". Cost is $16.99 for a 9 ounce jar. 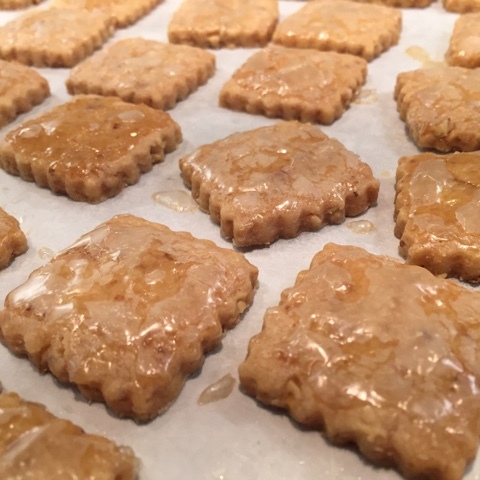 There are pages of recipes available on the site as well, many of which call for maple sugar and maple syrup as opposed to maple cream. Suffice it to say, one could slather this stuff on pretty much anything - how about a day old croissant, nicely toasted? Or add some to your hot morning oatmeal? Or drizzle some over toasted nuts and enjoy with a nice sharp cheddar cheese? Don't be afraid to use your imagination - come up with your own ideas!